I have recently had the pleasure of building a musical blog for D’Bunchovus. a wonderful group that features tight harmonies, marvelous string virtuosity, rhythm and humor. They make great acoustic music that is a rare delight to hear and see because these folks have personality and true comradery. I created their site using the MyBand theme, which I find to be feature packed and focused on the functionality that musical groups really need: a super player, a great event page plugin and a built in way market their music and sell it on line. 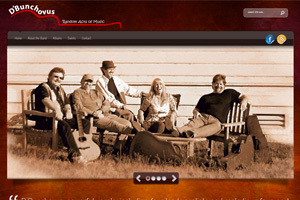 And best of all, it is extremely customizable, so every site is quite unique to the musical style of the group. So please visit their new site and give a listen to their new album. Oh, and I also designed their logo which is one of my favorites.